Perhaps you know of them as The Thousand Islands instead of The 1000-Islands? 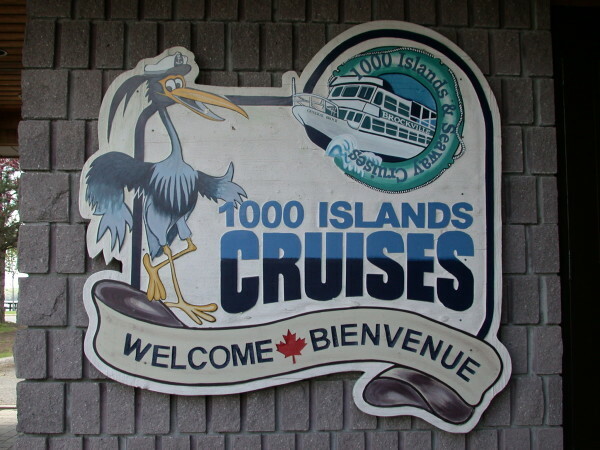 Regardless, if your stay in Ottawa is long enough to allow you to consider a day trip out of that beautiful city, visiting and seeing some of the 1800 plus islands that make up the world famous area known as the 1000-Islands should be on your list. We do, and hope you will, enjoy driving the 1000 Islands Parkway, located about 150 kilometers (110 miles) south of Ottawa, paralleling many of the islands, some a few square yards in size, others, quite large, large enough to have castles built on them. The 1000 Islands span about 80 kilometers (50 miles) of the St. Lawrence River, a river that forms the boundary between Canada and the United States. They start just downstream on the St. Lawrence, east of Kingston, Ontario. and run almost nonstop almost all the way to Brockville, Ontario. You can drive alongside the St. Lawrence River along the 1000 Islands Parkway, gazing over sometimes calm and sometimes turbulent St. Lawrence River into New York State from the Canadian side as you sift along this bucolic roadway. Drive south from Parliament Hillin Ottawa on any of the north / south roads a short while until you reach the 417 highway (also known as the Queensway). Take the 417 heading west and travel 10 to 15 kilometers (6 to 9 miles) until you reach the 416 merge to the left. Take that merge and head south on the 416. After about an hour you will reach the 401 highway. Take it westbound towards Brockville. Brockville is also a beautiful city to visit, and has had for years, what I believe, to be one of the best “fish & chip” take away restaurants anywhere, as well as one of the best parking spots on Blockhouse Island with wonderful views of the St. Lawrence allowing you to sit at and enjoy watching the busy river life sail by while you munch excellent fish and hot, home cut french fries. If your time permits, travel south from the 401 into Brockville, and enjoy what this welcoming burg has to offer. As you pass Brockville on the highway the 401 westbound, move into the left lane as you will soon encounter the 1000 Islands Parkway exit, which exits to the left, from the busy 401 highway. Take this exit, immediately slow down to 70-80 kilometers per hour (40-50 MPH) and enjoy the next 50 kilometers (30 miles) of scenic 1000 Islands Parkway, which ends near Gananoque Ontario. 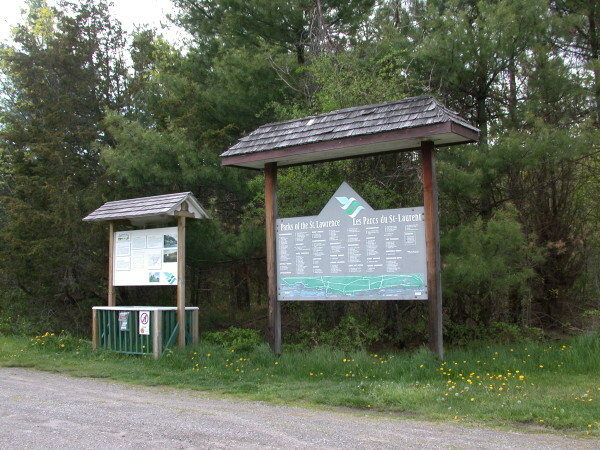 Just after you enter the 1000 Islands Parkway from the Brockville end, you can find the information signs shown below, on the right side of the Parkway. There is parking to allow you stop stop and read up. On the Canadian side of the St. Lawrence River, the 1000 Islands Parkway offers the visitor a host of amenities as well as gorgeous vistas. On the Thousand Islands Parkway you can find marinas to launch, rent or moor your boat (the fishing in the 1000 Islands is great! ), restaurants, resorts, picnic areas, provincial campgrounds, private lodgings and campgrounds, the famous 1000 Island cruises, golf and much more. Small villages abound along the Parkway, such as quaint Rockport, the entry to which is shown in the picture below. 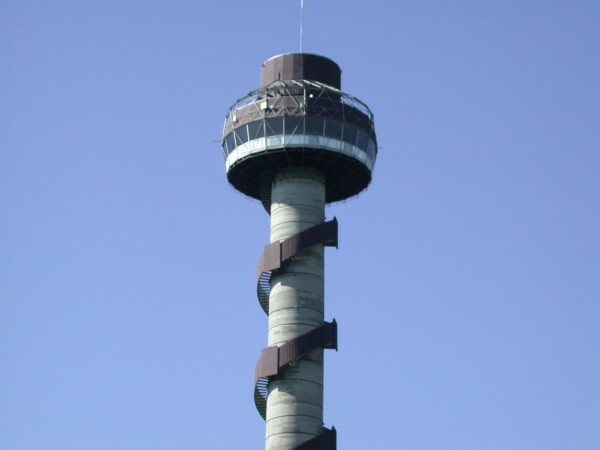 The tower on Hill Island, overlooking many of the 1000 Islands, is pictured below. From the Parkway, you can see many of the 1000 Islands, including some that are very small indeed. 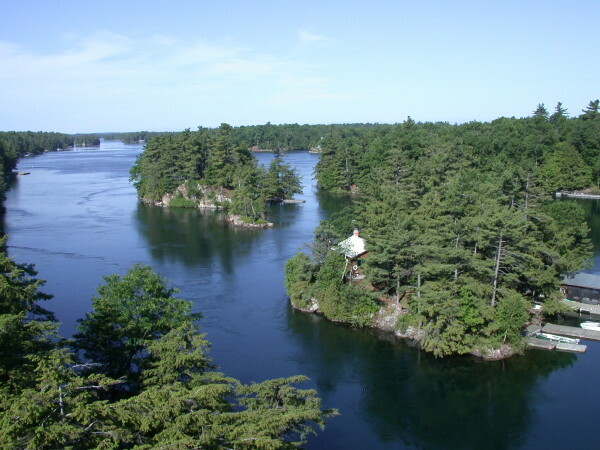 Small or not, a lot of these 1000 Islands are in private hands, and gosh, who doesn’t want a cottage on an island? Even at reduced speed your time along the 1000 Islands Parkway will sift on by and when you reach Gananoque Ontario, you have reached the end of the Canadian side of the 1000 Islands Parkway. Gananoque is worthwhile visiting for it’s own right. There you can refresh yourself for the return journey to Ottawa, or perhaps take time to visit the 1000 Islands Casino and “invest” a few dollars in gambling? Save enough for gas for your return journey though, won’t you? Gananoque, western gateway to the 1000 Islands boasts some very nice hotels and is the home of the 1000 Islands Playhouse where a visitor can take in some world-class live theatre, right on the shores of the St. Lawrence River.